After defeat in Moscow in Group G, Real Madrid could not afford to slip up on another tricky away day in the Champions League. Fortunately, against Viktoria Plzen, Los Blancos rediscovered the best versions of themselves and notched five with ease in the Czech Republic. There was an impressive brace from Karim Benzema alongside a Casemiro header, Gareth Bale finish and Toni Kroos chip to seal a vital three points. 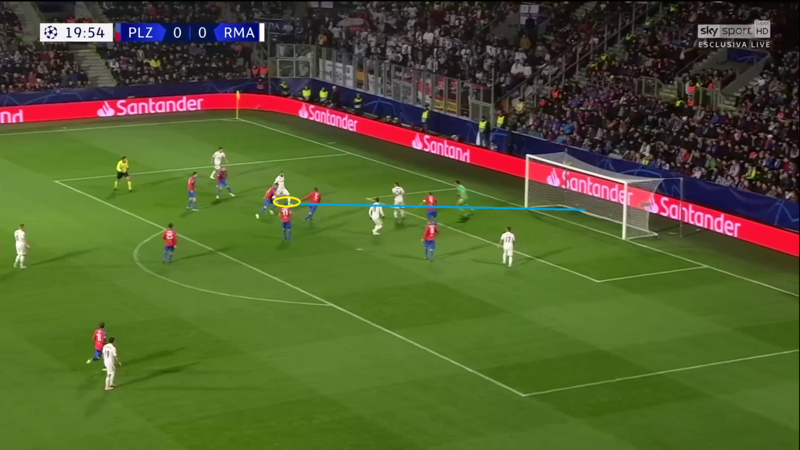 Here, our tactical analysis will use statistics to identify what key points Real Madrid can take from the game as they finally got back to their best. Notching his 200th goal for the club and becoming only the seventh man to do so, Karim Benzema scored a memorable effort to break the deadlock on 20 minutes. Weaving in and out of defenders, he made it look simple as he went past four men and finished with aplomb. It was the kind of finish that was expected of the Frenchman this campaign but has vanished in recent weeks with his form dwindling. Now, it looks like he may finally be getting back to the kind of magic that he is capable of creating. Where the first goal was a superb solo effort, his second goal was pure poacher’s instinct. His movement in the box as a cross came in was excellent, finding the half-a-yard of space required to be ready for any rebound and it came his way as he flicked his header into the back of the net. These are the goals that have never disappeared from Benzema’s game but come more and more as his confidence soars and that certainly seems to be the case. Getting a prolific goalscorer to replace Cristiano Ronaldo will be fundamental to Santiago Solari’s success at the club and the form of Benzema looks to be confirming what he is capable of. It is great news for the manager and even better for the centre-forward’s long-term future at the Estadio Santiago Bernabeu. Sergio Reguilon admitted to feeling unwell in the 24 hours leading up to the game but with no other option, the 21-year-old stepped up and played and built on a brilliant La Liga debut against Real Valladolid on Saturday. Again a threat in attack and defensively astute, the homegrown talent is making it look more and more difficult for Marcelo to find an easy route back into the team when he makes a return from injury. What was perhaps even more exciting was the introduction of Vinicius Junior for a 32-minute substitute appearance. With seven touches in the box and two progressive runs, the Brazilian added a smart assist showing patience and astute decision making to hold off and then set-up Toni Kroos to score a fifth and final goal of the evening. It is exactly the kind of counter-attacking threat that has been missing in this team of late. Solari’s faith in the youngsters has justified Florentino Perez’s decision to put him in charge. Where Julen Lopetegui was reluctant to give such opportunities, perhaps in fear for his own job, Solari knows these players better than anyone given his past at Castilla and clearly has no problem with gambling on them to prove a point. What’s more, it allows the chance to rest star men who are looking more and more tired, like Luka Modric. So far, the gamble is paying off. A 4-3-3 shape has been the norm for Real Madrid for years now, whether it was the Bale-Benzema-Cristiano trident or not. From the Carlo Ancelotti era right through Rafa Benitez, Zinedine Zidane and Julen Lopetegui, it was unusual to see another system emerge. Yet, just three games in, Santiago Solari appears to have changed tact and gone for a 4-2-3-1 role with Dani Ceballos featuring in a more advanced midfield role. 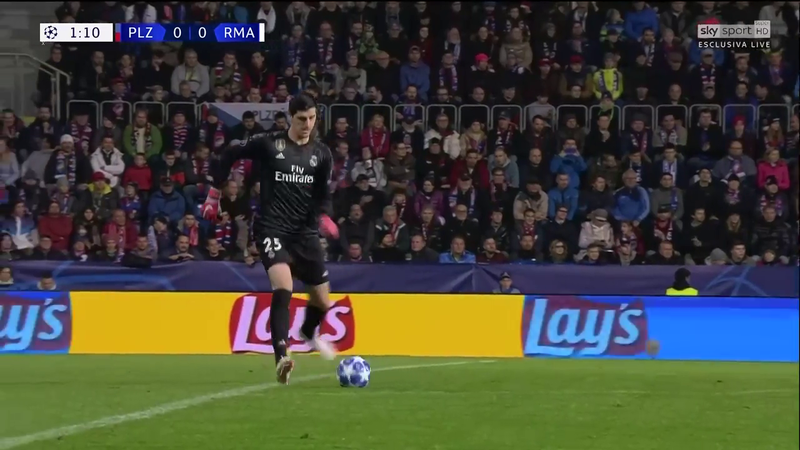 Such a position could equally be occupied by Isco but on this occasion, it was the young midfielder who got the nod to fill in behind Benzema. With Gareth Bale and Lucas Vazquez on the flanks and in deeper roles than has been occasionally seen, they formed a more solid midfield five when defending and provided even more opportunities in attack as only Casemiro would sit back when on the offensive. 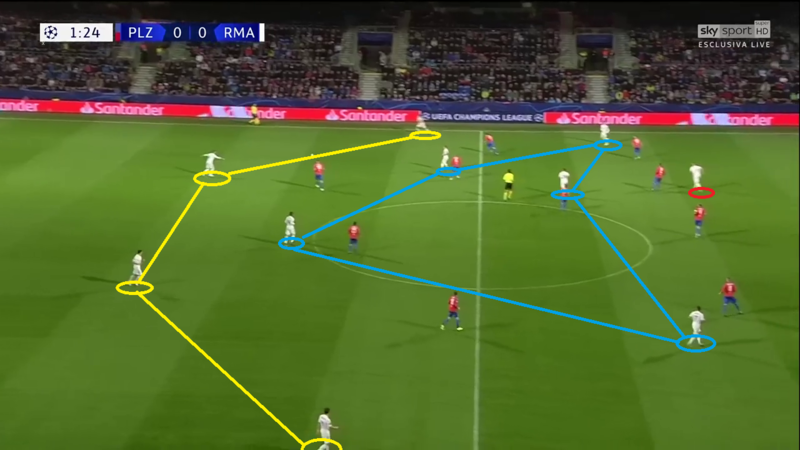 Benzema benefitted more than most, exploiting the additional space to drift wide and cut back inside, whilst Ceballos also looked far more comfortable in a more advanced position as he used to occupy for Real Betis. If this is how Solari can get the best out of his squad, it is a brave but seemingly accurate approach. Following the arrival of Thibaut Courtois in the summer, Keylor Navas’ days looked numbered in Chamartin. Yet, Julen Lopetegui opted to rotate the two shot-stoppers and fielded Navas in Europe whilst going with the new arrival in La Liga. It was an approach which was heavily criticised by many, but that gave a lifeline to the loyal Costa Rican who has led the team to huge success in recent years. The Belgian goalkeeper had done little to justify usurping his team-mate either. Whilst he did not make any glaring errors in his first few months at the club, nor did he show any kind of improvements and goals were being conceded more than at any point in Navas’ stint as number one. Solari’s decision to effectively permanently relegate Navas to second-choice spells the end for the former Levante man. Indeed, it is hard to imagine that he will still be at the club this time next year and he may well have plenty of potential suitors in January who could offer him an escape route and regular first-team action at a top European outfit. Next articleReal Madrid’s set-pieces – what’s changed?